I've wanted to try this method for a couple years now and finally just got up off the couch to do it! It's really just as easy as dying eggs the regular way, the only extra step you need to do is scrounge up old silk ties from your local thrift store. I decided to empty my eggs so that I could keep them for years to come. Using a small nail and hammer, I simply poked a hole in the top of the egg and another in the bottom. Then I used a straightened out paper clip to stick inside and break up the yolk a bit and then blew the egg out into the sink. Here's a good note: a bigger hole in the bottom makes it much easier for the egg to come out. Duh- but it took me a few eggs to realize that. Ha! It's not a fun job, like blowing up birthday balloons. No fun. The ties need to be 100% silk so make sure you look at the tag on the back. There were several ties that seemed like silk but didn't say so on the tag so I didn't buy those. I did however decide to experiment with one non-labeled tie to see if I was right in pinpointing it as silk. (It worked so I guess I was right.) You don't have to use ties either, you can use old silk shirts or boxers (yeah, that's gross if you get them at the thrift store) as long as they're 100% silk. These are the ties I ended up with. First cut off a piece of the tie big enough to cover your egg (usually the bottom of the tie). Pull out the padding and cut out the lining and tag. Next, using an old men's under shirt, cut squares large enough to cover your egg. One for each egg you're dying. You can also use an old pillow case or sheet. Pick these up at the thrift store with the ties if you don't have any at home. Then take one of your silk pieces and wrap the egg with right side of the silk facing out against the surface of the egg. Next cover the silk wrapped egg with a cotton square and secure all the fabric at one end with a twist tie, making sure the fabric is nice and snug to the egg. Now you are ready to start the dying process. Place the wrapped eggs in the bottom of a pot and fill it with water until the water is just above the top of the eggs. Add three tablespoons of vinegar to the water. Since my eggs were hollow they floated to the top so in order to keep them down and have them dye evenly I put a smaller pot on top of them to hold them under the water. Bring to a boil and then simmer for another 20 minutes. Pull the eggs out using a tong or spoon and let them cool completely before unwrapping. 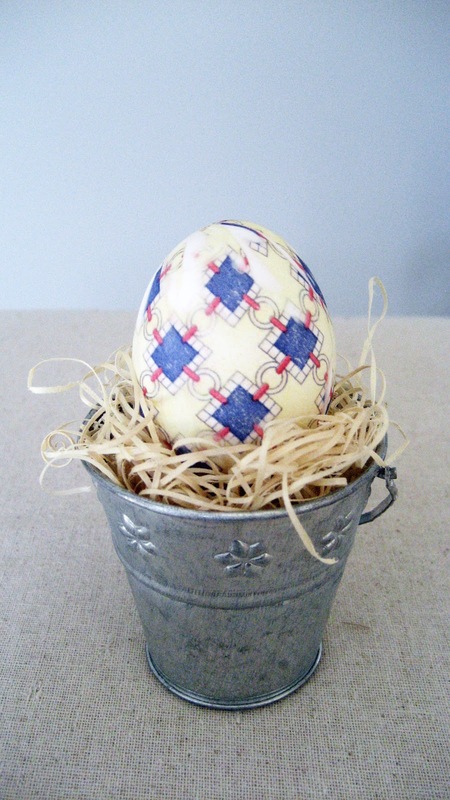 Unwrap and enjoy your unique and pretty eggs! These are my two favorite eggs. Ties with small tight patterns will translate literally onto your eggs. Larger patterns will result in a water colored look. Try to make sure the fabric is sitting as flat against the egg all the way around, even near the top and bottom. I had a few eggs with a few white lines in them where the fabric had puckered away from the egg. This is so totally cool! I have never seen this done before, but I think Dear Daughter and I are going to give it a try this weekend... thanks for the tip! Jany, drop by again, I was still editing at the time you commented! I just couldn't resist, had to add your tutorial! Very cool! The eggs look great! That is really cool. I never thought you could dye eggs with ties. Thanks for sharing! That is such a fun and creative way to dye Easter eggs! Thanks for sharing! Watch my son!---------------------- Cameron the Science Kid!